Prominent & Leading Manufacturer from Bengaluru, we offer EEG-Electrode, Optical Dust Sensor, Finger Print Sensor(USB), Carbon Monoxide Sensor, Heart beat sensor and Analog-moisture sensor. 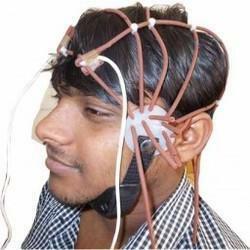 Many people are interested in what is called neurofeedback or EEG biofeedback training, a generic mental training method which makes the trainee consciously aware of the general activity in the brain. This method shows great potential at improving many mental capabilities and exploring consciousness. Other people want to do experiments with brain-computer interfaces or just want to have a look at their brain at work. GP2Y1010AU0F is a dust sensor by optical sensing system. An infrared emitting diode (IRED) and an phototransistor are diagonally arranged into this device.It detects the reflected light of dust in air.Especially, it is effective to detect very fine particle like the cigarette smoke.In addition it can distinguish smoke from house dust by pulse pattern of output voltage. The U.are.U 4500 Reader is a USB fingerprint reader featuring an elegant, sleek design with a soft, cool blue glow and, of course, the unsurpassed performance DigitalPersona is known for. Made for power-users and shared environments, the 4500 is the natural choice for those who want and need the very best. This heart beat sensor is designed to give digital output of heart beat when a finger is placed on it. When the heartbeat detector is working, the top-most LED flashes with each heart beat. This digital output can be connected to micro controller directly to measure the Beats Per Minute (BPM) rate. It works on the principle of light modulation by blood flow through finger at each pulse. Module dual output mode, digital output is simple, serial output with exact readings. This basic piezo sensor can be used in anti-theft devices, electronic locks, mechanical equipment vibration detection, sound gesture application and detection range bull's-eye counts vibration testing occasions. These vibration levels could be given to any controller/processor and necessary decisions could be taken through it. Module triple output mode, digital output is simple, analog output more accurate, serial output with exact readings. Light dependent resistor (LDR), suitable for use in projects which require a device or circuit to be automatically switched on or off in darkness or light. As the amount of light falling on this LDR increases, its resistance decreases. The light detector itself is just 5mm in diameter. Module triple output mode, digital output is simple, analog output more accurate, serial output with exact readings. Ultrasonic Distance Sensor comes with an ASCII serial O/P and provided optimum ranging & detection of long to short distance ranges. Owing to their stable, precise, non-contact and accurate distance measurements from about 2 cm to 4 meters.Compactly designed, easy usable, high ranging and easily interfaced upon micro controllers RX and TX pin. Ultrasonic sensor provides stable and accurate distance measurements from 2cm to 450cm. It has an focus of less than 15 degrees and an accuracy of about 2mm. Used to detect the move of human or object. Suitable for indoor and outdoor burglar proof application, vehicle application, ATM survillence camera etc. The PIR (Passive Infra-Red) Sensor is a pyroelectric device that detects motion by measuring changes in the infrared levels emitted by surrounding objects. This motion can be detected by checking for a high signal on a single I/O pin.A PIR detector combined with a fresnel lens are mounted on a compact size PCB together with an analog IC,SB0081, and limited components to form the module. High level output of variable width is provided. The ADXL345 is a small, thin, low power, 3-axis accelerometer with high resolution (13-bit) measurement at up to ±16 g. Digital output data is formatted as 16-bit twos complement and is accessible through either a SPI (3- or 4-wire) or I2C digital interface. The ADXL345 is well suited for mobile device applications. It measures the static acceleration of gravity in tilt-sensing applications, as well as dynamic acceleration resulting from motion or shock. Its high resolution (4 mg/LSB) enables measurement of inclination changes less than 1.0°. Several special sensing functions are provided. Activity and inactivity sensing detect the presence or lack of motion and if the acceleration on any axis exceeds a user-set level. Tap sensing detects single and double taps. Free-fall sensing detects if the device is falling. These functions can be mapped to one of two interrupt output pins. An integrated, patent pending 32-level first in, first out (FIFO) buffer can be used to store data to minimize host processor intervention. Low power modes enable intelligent motion-based power management with threshold sensing and active acceleration measurement at extremely low power dissipation. This resistive touch screen can be used with a stylus or fingertip and is easy to use with a micro controller. You can put it over a paper overlay for a touch control panel or attach it to an LCD to DIY a touch-activated display. Readings are taken by putting 5V across two of the pins and doing an analog to digital conversion on the other two pins. Full X and Y position can be achieved with only 4 GPIOs. The strain gauge pressure sensor for high-precision resistor load cell electronic scale sensor. The ACS712 provides economical and precise solutions for AC or DC current sensing in industrial, commercial, and communications systems. The device package allows for easy implementation by the customer. Typical applications include motor control, load detection and management, switch mode power supplies, and over current fault protection. The device is not intended for automotive applications. ACS712 provides economical and precise solutions for AC or DC current sensing in industrial, commercial, and communications systems. The device package allows for easy implementation by the customer. Typical applications include motor control, load detection and management, switch mode power supplies, undercurrent fault protection. The device is not intended for automotive applications. The TCS3200 programmable color light-to-frequency converters that combine configurable silicon photo diodes and a current-to-frequency converter on a single monolithic CMOS integrated circuit. The output is a square wave (50% duty cycle) with frequency directly proportional to light intensity (radiance). Level switch magnetic reed switch and float by the composition of the reed switch encapsulated in the guide rod , fitted with a ring magnet in the float when the float moves up and down with the measured liquid level , its internal magnet to attract magnetic reed switch contact action , thereby detecting the level position as a level control or direction . Our pH Sensor can be used for any lab or demonstration that can be done with a traditional pH meter. This sensor offers the additional advantages of automated data collection, graphing, and data analysis. Typical activities using our pH sensor include studies of household acids and bases, acid-base titrations, monitoring pH change during chemical reactions or in an aquarium as a result of photosynthesis, investigations of acid rain and buffering, and investigations of water quality in streams and lakes. This sensor includes a humidity measurement component and an NTC temperature measurement component.DHT11′s power supply is 3-5.5V DC. Fingerprint processing includes two parts: fingerprint enrollment and fingerprint matching (the matching can be 1:1 or 1:N). When enrolling, user needs to enter the finger two times. The system will process the two time finger images, generate a template of the finger based on processing results and store the template. When matching, user enters the finger through optical sensor and system will generate a template of the finger and compare it with templates of the finger library. For 1:1 matching, system will compare the live finger with specific template designated in the Module; for 1:N matching, or searching, system will search the whole finger library for the matching finger. In both circumstances, system will return the matching result, success or failure.